Picture it: Stellenbosch, South Africa, April 2002. I am dragged, almost literally kicking and screaming, onto the dance-floor of a huge party to celebrate the conclusion of Cape Wine 2002″. My assailant ignores my protestations that I am to dancing as a fish is to pursuit cycling, and bops so furiously that her entire glass of 2000 Shiraz flies through the air, and over my pale green shirt. That was my intoduction to an American product called “Wineaway”. As I dripped my way back to my seat, handfulls of napkins were thrust in my direction, and a range of tips and instruction began ringing in my ears “now throw on some white wine”, “take your shirt off and get it into cold water immediately”. None of these options sounded too attractive. Suddenly, from out from the throng, strode a tall American woman, who reached into her handbag and withdrew a small bottle. “I’ve got just what you need”, she said, and before I knew it, I was being liberally squirted with a vaguely citrus-scented liquid spray that seemed to sit on top of the fabric of my shirt, effervescing ever so slightly. I was contacted recently by a company which had also discovered the product, and has just started importing it into the UK. They sent me a little sample pack, containing Wineaway, a square of beige carpet, and a quarter bottle of Merlot with an invitation to test drive the product at my leisure. I made sure the wine was well rubbed-in, especially the large splash. The right-hand picture shows the result after 2 applications. So there we have it: I’ve tried it again and it seems to work. I have no idea how, or whether this is better than the other folk remedies, but it is a very convenient and effective product that has been recommended by Good Housekeeping magazine. Wineaway claims to be a secret formula of fruit and vegetable extracts, with no chemicals. 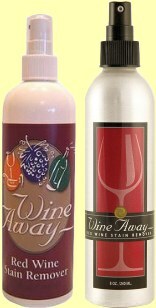 Wineaway is sold in 12oz bottles at £8.95, and there’s a handy pocket/purse-sized 2oz bottle available too. Buy it from Lakeland Plastics and from these wine retailers: Lea and Sandeman; La Vigneronne and Roberson. For those outside the UK, contact the US manufacturer Evergreen Labs. Please note: Tom Cannavan and wine-pages.com have no commercial connection with this product.